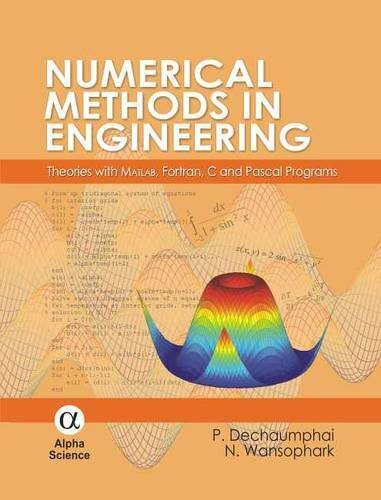 "Numerical Methods in Engineering: Theories with MATLAB, Fortran, C and Pascal Programs" presents a clear, easy-to-understand manner on introduction and the use of numerical methods. The book contains nine chapters with materials that are essential for studying the subject. The book starts from introducing the numerical methods and describing their importance for analyzing engineering problems. The methods for finding roots of linear and nonlinear equations are presented with examples. Some of these methods are very effective and implemented in commercial software. The methods for interpolation, extrapolation and least-squares regression are explained. Numerical integration and differentiation methods are presented to demonstrate their benefits for solving complicate functions. Several methods for analyzing both the ordinary and partial differential equations are then presented. These methods are simple and work well for problems that have regular geometry. For problems with complex geometry, the finite element method is preferred. The finite element method for analyzing one- and two-dimensional problems is explained in the last chapter. Numerous examples are illustrated to increase understanding of these methods for analyzing different types of problems. Computer programs corresponding to the computational procedures of these methods are provided. The programs are written in MATLAB, Fortran, C and Pascal, so that readers can use the preferred language for their study. These computer programs can also be modified to use in other courses and research work.